A parade in a gilded hall of mirrors: the firm footsteps of a woman seemingly rigorous yet sensual with an intense gaze. 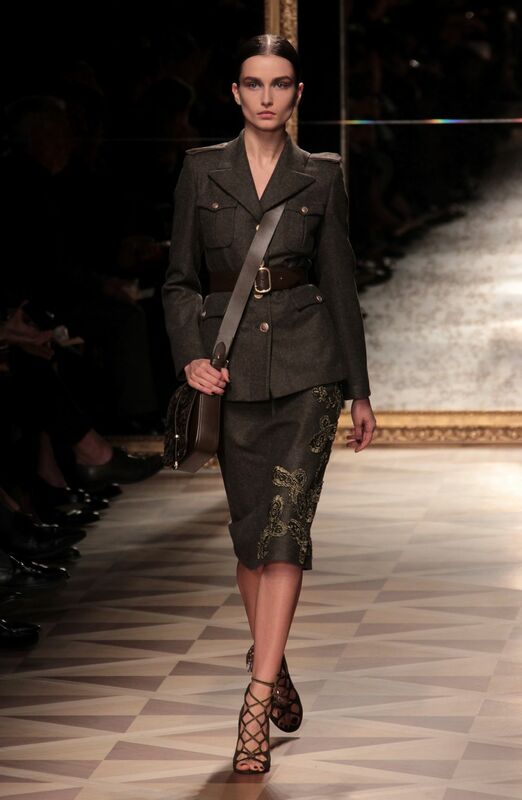 Her silhouette traced by a double-breasted overcoat of military cloth, leather lining and astrakhan collar. An aesthetic study in linearity taking shape in the impeccable tailoring of asymmetrical, close-fitting jackets and sophisticated pencil dresses worn with knee-high boots. Elegance is a question of detail: the antiqued gold of the signet buttons, the astrakhan skirt is smooth resembling fabric, and hems enlivened by a subtle play of Paisley and braiding. Steppe, Steel Grey and Baltic Blue enhance the chromatic depth of this rigorous season, complimented by fur trimming and total black leather – almost a uniform. For the evening, sartorial construction relaxes into an explosion of femininity. As in a fairy tale, the volumes of the overcoats become more generous and the fabrics change. Braiding enriched by touches of lurex and interlinking chains, hand worked crochet and alluring transparency produce sumptuously textured knitwear. Black is the common thread linking day and night, which ushers in autumnal woodland tones: Purple, Blueberry, Malachite and Bordeaux. This woman wears flowing skirts inlaid with a seductive patchwork of ribbon and braid, matching them with criss-cross chiffon blouses that bare her shoulders. Against the skin, the liquid effect of printed velvet illuminates the cape and the draped dress. In a crescendo of paisley patterns, embroidery and golden glints, fluidly soft chiffon dresses recreate the decorative flavour of a tsarina’s wardrobe. At her neck, the lustre of Victorian glass cameos set in silk and Swarovski crystals. Sandals and pumps with braided fastenings bare sensual portions of skin amidst a profusion of luxurious finishing. Embroidered velvet or breathtaking suede heeled boots are trimmed in rich astrakhan trimming. The bags are small jewels of craftsmanship: from the fluid forms of the small embroidered velvet bags to the clutch evoking Fabergé’s work at the court of the tsars and the enamelled metal minaudière that resembles an antique cigarette case. This is a double-edged femininity that revels in a sophisticated play of tailoring and seduction, in an exclusive mosaic of style: the new Salvatore Ferragamo collection for women.